Health Now! No to Wars of Aggression, No to Unjust Trade, Fight for People’s Health! is a call for action to bring together and unite health workers, activists, students, and organizations against the systemic forces that are affecting the quality of life for millions of people all over the world – military violence and unjust trade policies. It is a concrete expression of thousands of people and their commitment for social justice and social change. Health Now is the organizing vehicle for the Alliance for People’s Health to educate and mobilize people to learn about important and inspiring people’s struggles for health, land, justice, and liberation around the world. 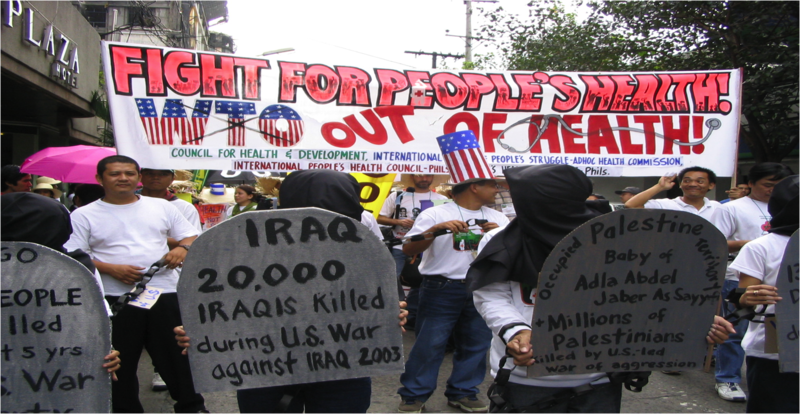 In 2001, health workers and activists from around the world gathered in the Philippines to share the impact on health due to military violence, unjust trade policies, and occupation of land. Their goal was to not only expose the devastating conditions and injustices that lead to human suffering and death in the Global South, but also to link up their struggles for health and social justice. Health Now! No to Wars of Aggression, No to Unjust Trade, Fight for People’s Health! is the campaign that was developed to unite health workers, allies and activists against the structural roots of ill-health and to take action for social change. Since the beginning of Alliance for People’s Health in 2006, the Health Now campaign in Vancouver has brought together different community organizations and individuals to educate and organize people on struggles taking place against military violence, unjust trade and occupation, such as in Afghanistan, Palestine and the Philippines. People have also mobilized to rallies, pickets and marches through Health Now to take action. In Afghanistan, NATO troops have destroyed health infrastructures, villages, killed and wounded thousands of civilians and displaced millions of Afghani people worldwide. Further, the Canadian government and businesses are profiting enormously from supplying arms and reconstruction projects. We demand that the Canadian government immediately withdraw from Afghanistan, Haiti and all other wars of aggression that are undermining the health of people. Trade policies that benefit governments or businesses at the expense of the well-being and development of other nations or groups are unjust, such as the Canada-Israel Free Trade Agreement (CIFTA). This agreement allows for the flow of billions of dollars worth of goods and investment between Canada and Israel while the Israeli government continues to cut off vital medical and food supplies to Palestinians, engages in targeted killings of health workers and destruction of health facilities and violently displaces Palestinians from their land. We demand that the Canadian government suspend all trade and military agreements with Israel until the Israeli government ceases to inflict violence and suffering on Palestinians and its colonial settler project on Palestinian territories. We also demand that Canada withdraws from the World Trade Organization and any other institution that imposes unjust trade policies. Numerous studies show that poor and marginalized people suffer disproportionately from cardiovascular diseases, mental illnesses, violence and injury. Clearly, people’s health is determined not only by biological and physiological factors, but also largely by social factors and the conditions that people live under. These social determinants of health such as employment, education, and housing, are undermined under neoliberal policies that serve the interest of one class over another. Privatization of health care is an example of a neoliberal ideology that serves to benefit businesses at the expense of the healthcare, livelihood and dignity of health workers and the working class. In order to change our situation for the better we need to unite and organize our communities to demand for our rights and health. How to get involved in Health Now! Land Day on March 30 marks the Palestinian uprising against Israeli occupation. Events that take place around Land Day include an educational forum on Indigenous, Palestinian, South Asian, Latin American and other struggles for land as well as a rally on March 30. The Alliance for People’s Health and other local organizations coordinate a rally and picket at a Canadian mining corporation to expose the terrible impacts on health and the environment in Latin America and the Philippines. An educational event that will feature a panel with speakers and presentations on neoliberalism and its consequences on health, grassroots community organizing for social change, and the social determinants of health. An educational forum to learn about the impact_ on health under occupation and military violence and how communities are organizing themselves to build people power to take control over their own lives. To build genuine people-to-people solidarity with health workers in the Global South, we coordinate trips where health workers and community organizers from Vancouver can integrate into community-based health programs that are a part of a broader movement for social justice. When APH members participate in solidarity integrations, they are sharing knowledge and skills for health as well as learning about the key health issues and struggles and methods for community diagnosis. Upcoming integrations are with health organizations in Palestine in 2010 and the Philippines in 2011. If you are interested in supporting or participating in these integrations please contact us. Community diagnosis is the process where people of a community organize to investigate the roots of the health problems in their community and come up with strategies for social change. The Alliance for People’s Health carries out community diagnosis through the People’s Health Series and workshops. We will also train community health workers to carry out community diagnosis in the near future.